Some interesting news from the California High-Speed Rail Authority on Friday; the agency released the results of the bidding competition to design and build the first 28-mile segment of bullet train tracks between Fresno and Madera. The low bid of $985 million came in below agency expectations, which is good news. This is the first of five construction contracts to be awarded to complete the 130-mile Bakersfield-to-Merced section of the project. The Merced-Bakersfield line is proposed to be the backbone of a 520-mile, $68 billion passenger rail system linking San Francisco and Los Angeles with electric trains capable of traveling at up to 220 mph. Trains are not expected to carry passengers until 2022 at the earliest, when the authority hopes to operate between Los Angeles and Merced, where passengers would connect on existing Amtrak or other commuter train lines to the Bay Area. 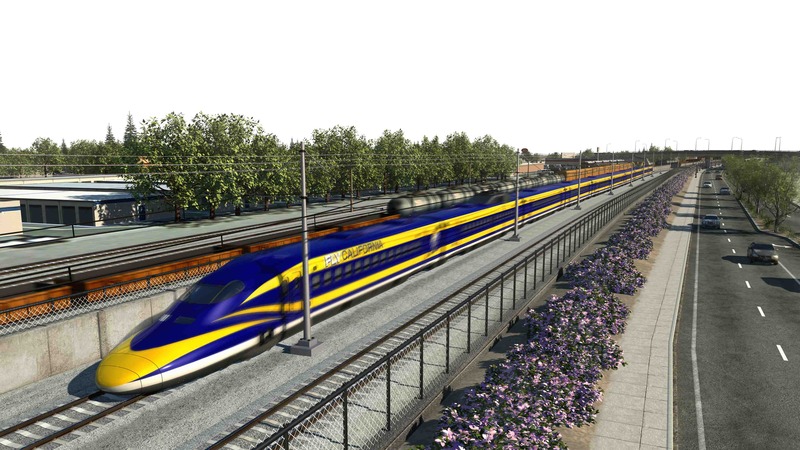 The California High-Speed Rail Authority’s Board of Directors still must approve the contract for the first 28-mile segment that went out to bid. That is expected to happen “within weeks,” said an agency spokesman, with the Authority hoping to begin construction later in the year. A rendering of a bullet train along Shaw Avenue in Fresno. Source: California High-Speed Rail Authority. As this possibly becomes reality, I am hoping after all is said and done (if and when), that it is a safe ride. I can understand wanting it built, but its operation is where I am looking now. It seems as if HSR is being a bit stubborn, and is really looking to prove naysayers wrong, but the latest opposition has come from what once where supporters. Why? This is starting to remind me of the Simpsons episode about the Monorail….(sigh). And Miguel, I’d guess the exact same. In addition to rail bridges over the San Joaquin River and Freeway 99, there’s a tunnel north of downtown and a dozen auto overpasses that also serve existing UP and BMSF trackage that will be a giant benefit to even the non-train riders of Fresno. Doesn’t Tutor Perini have a history of lowballing their bids to win the job and following it with lots of cost overruns? This is just me, but I wouldn’t use their bid number as any sort of legitimate estimate. Yes, Tutor was dubbed the “Chage-Order” king by former Mayor Tom Bradley. Change-Orders are (in my best layman’s vernacular) when a contractor essentially says that the original bid was too low and that it will cost more to build such project after all, in the middle of construction. The MTA even had to sue Tutor. As for the stupid blended approach: These trains attain such high speeds not so much because of the locomotion, but because the cars are extremely light-weight. Such light-weight cars are PROHIBITED by FRA to share track with freight or existing commuter rail. The reason is that these light-rail cars vs. heavier freight or commuter rail would be many more deaths aboard the light-weight cars. So, the only way around the prohibition is to get a waiver from the FRA, and that would take us to the concern of an earlier poster about SAFETY. HSR should come forward with how they will deal with this. If they plan to use heavier cars to meet FRA standards of sharing track with heavier trains (a loss of speed, perhaps), or if they plan to seek a waiver, but that would be fodder for the press and public. Which is it, HSR?